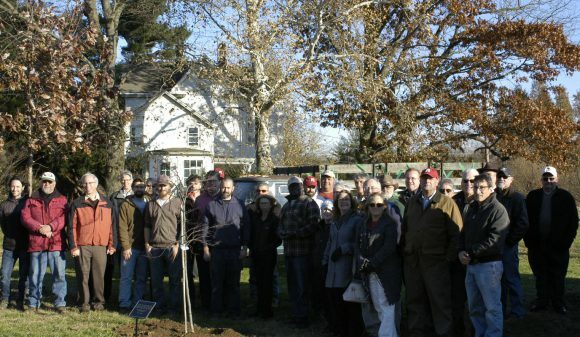 Share the post "Colleagues, Friends and Family Remember Glenn Tappen at Hort Farm 3 Tree Dedication"
Family, friends and colleagues from the Department of Plant Biology and NJAES gathered at Hort Farm 3 to remember Glenn Tappen. On Monday, Nov 27, 2017, a tree planting ceremony took place at Horticulture Research Farm 3 on the George H. Cook Campus to honor the life of Glenn Tappen, who passed away on Aug. 26, 2016. A research farm supervisor, Tappen joined Rutgers in 1969 and spent his entire career of 47 years supporting colleagues within the Department of Plant Pathology and later the Department of Plant Biology and Pathology until his passing. This redbud tree is planted in honor of Glenn Tappen, a generous, compassionate gentleman who had tremendous integrity and who, as a Supervisor of Rutgers Hort Farm 3, devoted 47 years to helping Rutgers faculty and students. Dedicated with great appreciation by his friends and colleagues, November 27, 2017. 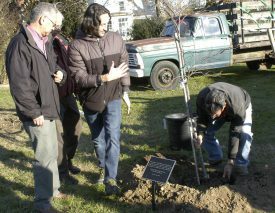 L-R: Don Kobayashi, Bruce Clarke, Tom Molnar and Joe Florentine secure the roots of the eastern redbud planted in memory of Glenn Tappen. A large gathering of friends, family and colleagues joined in the celebration, with words shared by many, reminiscing about what Glenn meant professionally to the department and personally to friends. Remembrances included those from longtime colleague Emeritus Professor II Tseh An (John) Chen, who was not present but sent the following words of condolence: “Glenn was a very large, strong man but with a very soft, tender and gentle heart. He always took great responsibility in his works. I considered him as a good colleague and close friend. I will certainly miss him terribly.” Dr. Chen’s words summed up what many of his co-workers felt about Glenn. The bright, sunny, late-autumn day was appropriately reflective of honoring a man who meant so much to those who knew him and they will dearly miss his presence.